Hey, you wanna see something really scary? Then follow us Into the Black - if you dare! 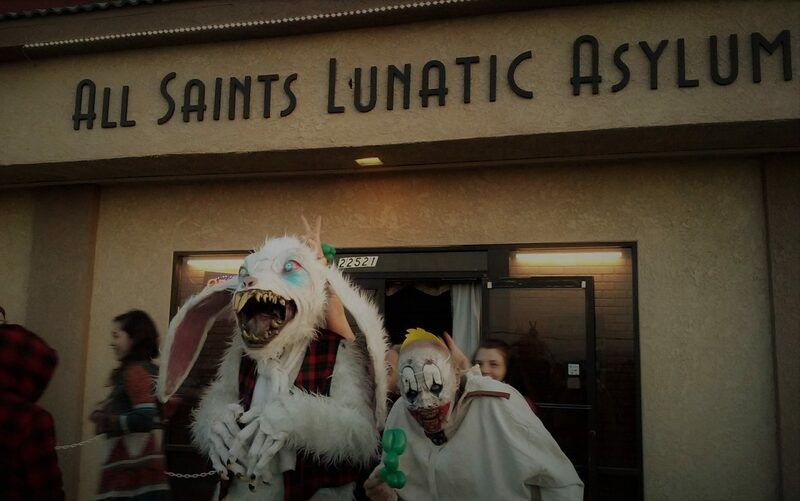 There are myriad Halloween attractions in Los Angeles: amazing, amusing, atmospheric, and astounding are some of the adjectives we use to describe them. But how many are genuinely frightening? Very few deliver more than the sudden shock of a jump-scare. The new Into the Black Halloween haunt, making its debut at the Fairplex in Pomona, made our flesh creep in ways we seldom experience. Note: This page has had "shocking" content removed in order to comply with AdSense standards. If you would like to see this page uncensored and ad-free, please consider making a donation by clicking here. 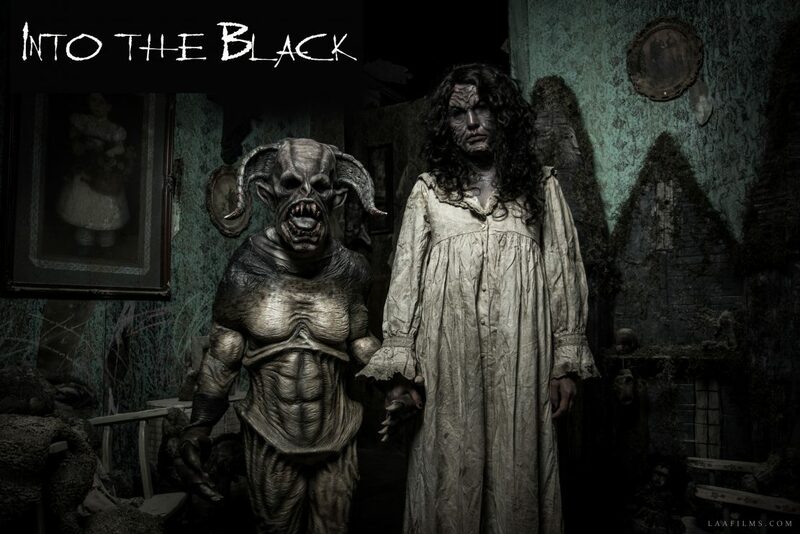 The brainchild of Larry Bones (Boneyard Effects), Into the Black's Halloween attraction feature three components: a film, a walk-through haunted house, and a virtual reality experience. The film (not screened for the press) fills in the back story, preparing audiences for what will follow, showing a paranormal investigation of a cursed dwelling. The haunted house allows customers, one by one, to follow in the footsteps of the investigators, seeing the haunted house as it looks today. The virtual reality experience takes participants into the past, showing the horrible events that led to the haunting. 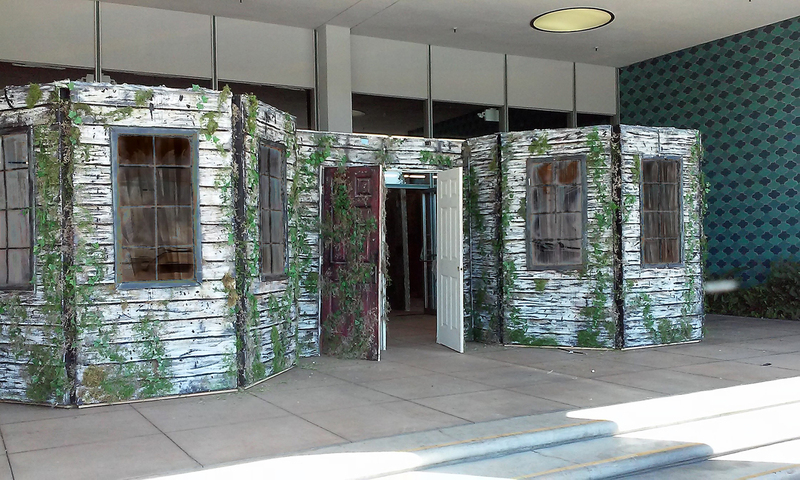 Into the Black's Haunted House employs a unique strategy, at least during daylight hours (the event opens at 2pm). A facade out front suggest the entrance to a decaying manor; the maze is located within the building. The first few rooms, clearly illuminated by light seeping in from outside, are not very intimidating. Fading wallpaper, hanging loosely from the walls, suggests former elegance eaten by decay, but there is little to disturb your comfort zone - at first. Gradually, moving deeper into the house leaves the light behind; all that remains is the flickering of dim candles high on the walls, acting like airport runway lights in the darkness. What had seemed to be a safely spooky fun house now becomes more ominous: corridors narrow; wood is replaced by rock; you seem to be reaching some nether region not intended for guests. Sounds scurry in the darkness - first in front, then behind. Is there something in the next room - or living inside the walls? The anticipation - the increasing tension - is dreadful. Still, there's nothing dangerous that can be seen - until, suddenly, from nowhere, a shadowy beast reveals itself, charging in pursuit along the corridor you just traversed. Try not to run away in panic, if you can. From this moment onward, the terror intensifies with each new apparition. They seem to lurk in every shadow, emerging from unexpected directions, and because you are walking through alone, there is no safety in numbers - their pursuit is focused and relentless, with pauses just long enough to worry about when and where the next attack will strike. You may feel a brief hope for respite as you move back toward the glow near the entrance, but this leads to a u-turn plunging you back into the black. Along the way, there is an occasional oasis of illumination - which exists solely so that a demon can proudly reveal itself to you in all its full-body glory - no mere killer klown or masked maniac, but an awesome denizen of Hell. Pray you make it out alive. The VR experience tells the back story of the haunt. Those fortunate enough to survive Into the Black's haunted house will be given the opportunity to endure the psychic residue of events long past, gaining insight into the source of the home's supernatural manifestations. A brief video explains that inanimate objects can become repositories of psychic energy, which can be tapped and translated into visual and audio single perceptible with special goggles and headphones. After you take a seat, attendants help you fit the equipment; soon you seem to find yourself in the presence of a little girl talking to you - but when she flashes a mirror in "your" direction, you realize she is addressing a doll. A glance down reveals tiny artificial hands and a frilly dress, confirming that you are seeing the psychic impressions stored in the young girl's toy. When she sneaks into her father's secret room, demonic hands grasp around a corner of broken masonry. The girl hides from out her outraged father, but the dark forces that have been unleashed are not so easy to outrun. Using the doll's point-of-view is a clever touch: it explains how we can "move" from room to room without actually moving: we are seeing what the doll "recorded" while the girl carried her from one room to the next; it also allows for quick scene transitions, since the image goes black every time the girl places her hand over "our" eyes (i.e., picks the doll up to take it somewhere). 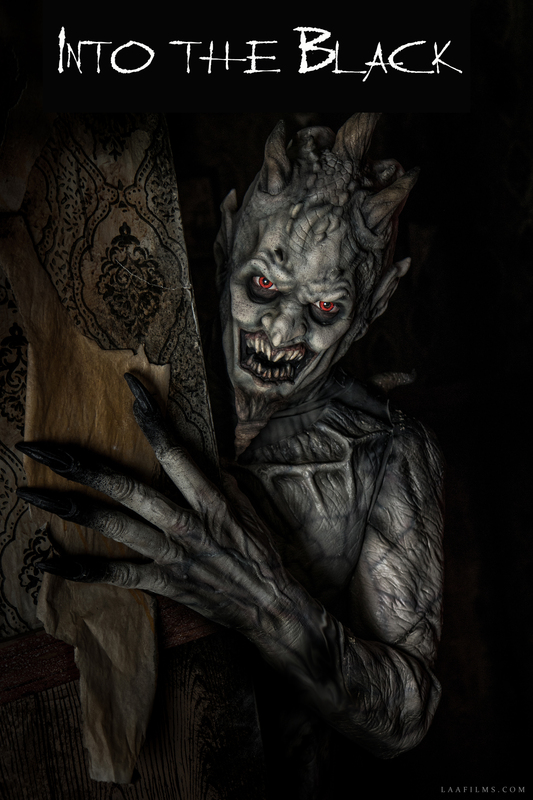 Unlike the Ghost Manor virtual reality experience at the Castle Dark theme park, Into the Black is live action instead of computer-generate imagery: it's like being immersed in a 3D horror movie rather than a video game. Into the Black's Virtual Reality experience is enhanced with physical effects: feathers brushing against skin, air blasting against eardrums. 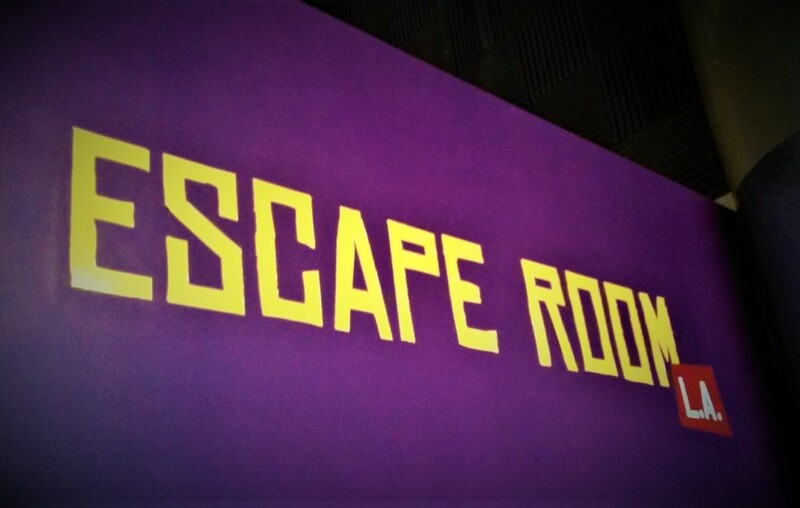 These scares serve double duty: not only do they add an extra jump; they also direct your attention in the right direction, so that you don't miss the climactic moments. As always, the potential pitfall of virtual reality is the desire to peruse the 360-degree environment: when you're trying to see everything, it's easy to be looking the wrong direction at a crucial point. Many are the gloomy hallways and mysterious corridors that we have traversed during the Halloween season, but seldom can we remember feeling so strongly that uncomfortable tingle running up our spine - the atavistic warning of something lurking behind us, ready to pounce - magnified by the unnerving knowledge that there was no way to escape. The effect is wonderfully orchestrated inside Into the Black's haunted house, with settings and sound effects that put us on edge long before the first demon emerged. How often have we heard haunters claiming to use empty space to generate suspense? Our cynical translation has always been: "You were too cheap to hire more actors." In the case of Into the Black, the buildup truly does escalate ever so slowly to an incredible payoff, and the payoff continues throughout the remainder of the maze. Into the Black's haunted house is so effective that the virtual reality experience cannot top it - the opposite of what we expected. The VR offers an amazing, immersive mini-movie, and the ultimate apparition had us jumping like a frog hit by lightning, but the sense of being one-step removed - of seeing past events that were happening to someone else - provided a sliver of comfort not available in the maze. If it were up to us, the order of the attractions would be reversed, using the VR to show participants the history of the haunt and then allowing them inside to experience the physical reality directly in person, not through the medium of a doll imbued with psychic impressions. Sometimes we feel as if we are running out of superlatives to describe the many Los Angeles Halloween Attractions we visit every October. We have been amused, amazed, astounded, and awe-struck. But we have no hesitation at all - absolutely none - about declaring that Into the Black is not only L.A.'s newest haunted house but also its scariest. The Into the Black Halloween haunt continues at the Pomona Fairplex on weekends in October, plus Monday, October 30 and Halloween Night. Hours are 2pm to midnight. The address is 1101 W. McKinley Avenue in Pomona, CA 91768; entrance Gate #1 is closest to the attraction, which is located near the Avalon building. Separate tickets are sold for the virtual reality attraction ($13) and the haunted house ($29).The Fairplex's page for the event is here. The official Into the Black website is here. Seldom can we remember feeling so strongly that uncomfortable tingle running up our spine – the atavistic warning of something lurking behind us, ready to pounce. We have been amused, amazed, astounded, and awe-struck by other Los Angeles Halloween Attractions, but we have absolutely no hesitation about calling Into the Black this year’s scariest haunted house. Find More Halloween Mazes and Rides in A Halloween Haunts Master List.